Our decals and signs are suitable for indoor or outdoor use on drums, tanks, containers and buildings. 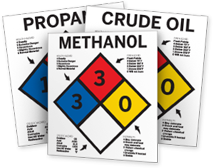 Choose self-adhesive vinyl or rigid aluminum signs with four mounting holes. Fully customizable sizes and information.